If you’re going to spend some time in Hollywood, you may as well do it right and live like the celebrities by staying at one of the many downtown Los Angeles hotel suites. Once you’ve established your rooming situation, head outdoors and explore all the areas that Los Angeles has to offer such as the iconic Fairfax District. 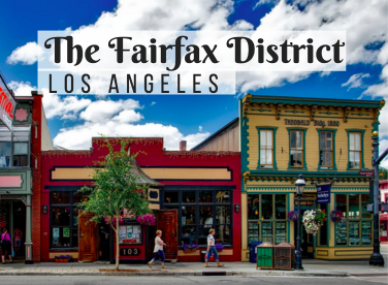 Read on to find out all that the Fairfax District has to offer! This historic stretch of shops was made famous thanks to the hit television show Melrose Place. One of the great things about this long street is that as you walk down the various blocks along Melrose Ave., you’ll find an eclectic mix of shops from chip boutiques and restaurants to budget-friendly thrift stores. Along Melrose, you’ll find antique stores, art galleries, bookstores, home goods, restaurants, cafes and more! Whatever you’re in the mood for, you’ll see it here. If you want to spot a celebrity, there’s a good chance you’ll see one at The Grove. At this outdoor shopping destination, you may see stars such as Leonardo Dicaprio, Elijah Wood, Jake Gyllenhaal, Dennis Quaid, Orlando Bloom, Nicole Richie, Kevin Bacon, Winona Ryder, and many others. Also at The Grove, you can shop at stores such as Topshop/Topman, Anthropologie, Banana republic, Barnes and Noble, Crate & Barrel, GAP, Michael Kors and more! Stop by for one of the restaurants located here as well. If you’re looking for a perfect Los Angeles experience, you’ll want to stop by Pinks. Locals know that if they want a great tasting hotdog, especially a chili dog, you go to Pinks. This Mom and Pop hot dog stand has been around since 1939, and it continues to be one of the best places for hot dogs in the area. Get the original Chili Dog that comes with mustard, chili, and onions for just $4.50! Stop by the museum and go on a self-guided tour using one of the complimentary audio guides offered by the museum. The museum works both to commemorate and honor those who were affected by the Holocaust while also striving to educate the next generation. The museum is open Monday-Thursday from 10am-5pm, Friday from 10am-2pm and weekends from 10am-5pm.